recently acquired a used COPAM 2500, trying to start this bad boy up has been frustrating. everything works so far but when I go to cut I get this error : "Can not open the output device. Error intializing." 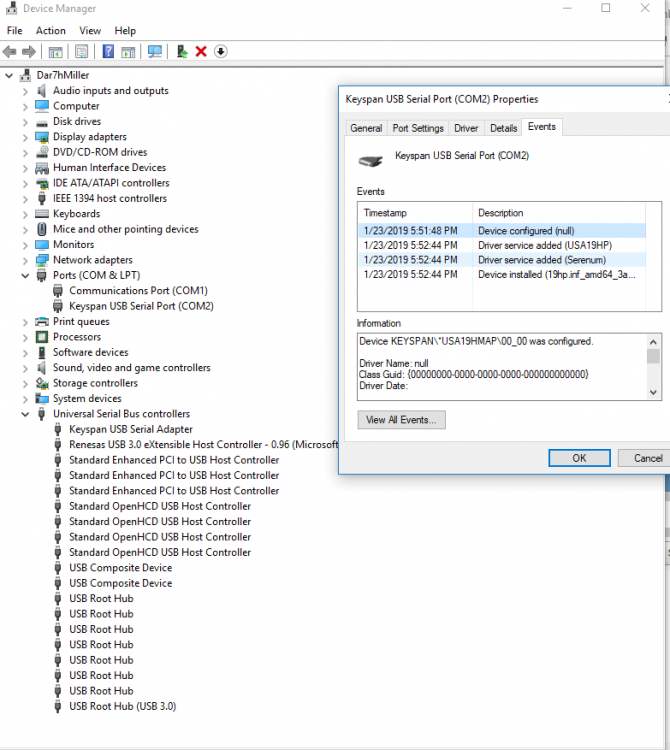 installed drivers, downloaded signblazer, using windows 10, my ports match. However I am using a serial cord with a usb adapter. does that matter? much praises and thanks for any help. Just any ol' serial to USB will not work on a vinyl cutter. The only one that always works is a Tripp-lite Keyspan Adapter. And check out the user manual in UScutter.com support, if you have not already. will any old serial cable work? Or do you have recommendations for that as well? Does the copam need a straight or nul modem serial cable? Does the copam need a stra﻿ig﻿ht﻿ or nul mode﻿m serial cab﻿l﻿e﻿? thank you both for your help! will retry these steps tomorrow when my brain has recovered. Look it up, They are 2 different wired cables. So I learned this thing needs a straight serial cable. Also I got the adapter you recommended. However, I'm dumb. The adapter side is male and the port on my copam is male as well... is that normal? Do you recommend an adapter for that as well? I cannot find any keyspan usb adapters that are female. It seems like this adapter works better than the last cord I was using, but I still get the same error. Ok so Under my Port is says my drivers are configured as Null, I assume that's wrong. How do I configure as Straight? Post a pic of your screen where it tells you that. Your computer should have no idea what cable is hooked up to it. Ok actually I think I was confused this is what I saw. I think I'm messing up trying to install the the FTDI drivers. I follow all the steps and download the CDM exe. However, I don't have "USB Serial Adapter" under universal serial bus controllers like they do. Ok, I'm determined to get this dang thing working. Haumana- Yes I'm not sure what your getting at. I'm set up the virtual comport to be 2 because it started as 5 and flexisign only goes up to 4. I would have chose port 3 (as in the example in the install pdf) but it said in use. Not sure how to tell what its being used by or how to change what ever is using it, or if it even matters. 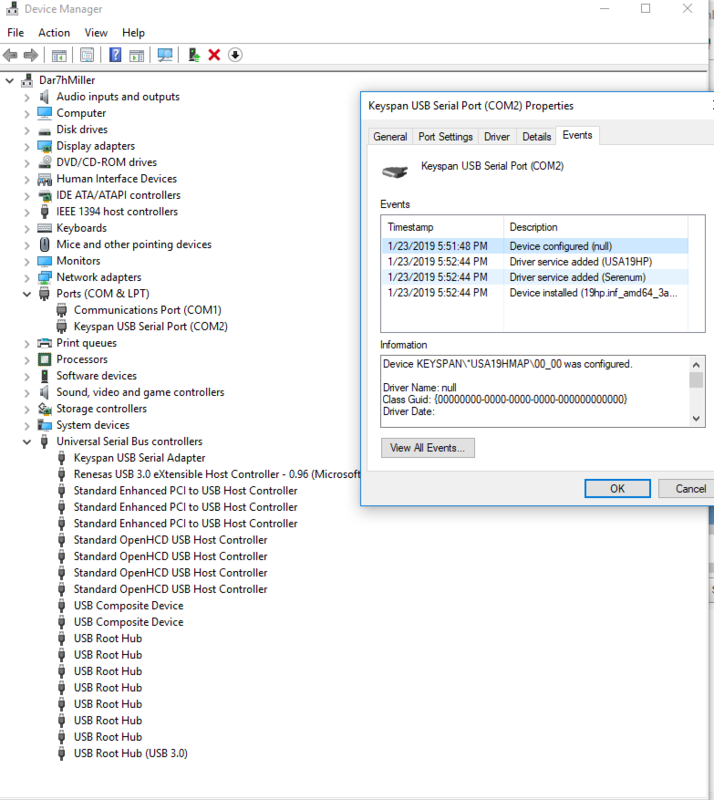 darcshadow- I do not have a 9-pin connector and I believe that port is reffering to my DVI-video port that I have a vga adapter plugged into for my monitor. If somehow that would be useful I could switch my monitor to hdmi port. Yes, and I'm using the cable that came with the Keyspan. Shouldn't that be the right one? If not how do I even find a straight serial Usb to Keyspan cable?